Two facets of the Singapore way of life were in the news this week which are linked to the concept of forging ties that bind. One was public housing and the other, national service. What this country is today owes much to these, carved out of a social compact between the PAP government and Singaporeans since independence. So far so good. But is it time to take a fresh look to see whether we can do things better, including so that the government and people are on the same wavelength? Take public housing. It was a remarkable success story by any standard. Housing 90 per cent of the population is not something other countries have been so fortunate to emulate. Whatever was said by PM Lee Hsien Loong at the ND Rally 2018 last Sunday, the homeownership scheme had its roots in what his father the late PM Lee Kuan Yew noticed when he toured a student riot street back in the early 1960s. People were more interested in protecting what they owned. He saw the lengths that some residents would go to make sure their scooters were carried out of harm’s way, at the risk of losing their lives. On another occasion, the late first PM, in introducing NS, said the question was: What were our males asked to protect and what could motivate them – and their families – to accept the sacrifice of spending their prime years training to be soldiers? “Not to protect Lucky Plaza (which at that time was an impressive landmark in Orchard Road) but their homes and their way of life”. The Housing Development Board story is part of the NS story and both are part of the larger Singapore story. In the early stages of public housing, most Singaporeans were just eager and grateful to jump from squatter living to modern housing. The “pigeon hole”, a common description of a HDB flat, which was theirs was better than uncertain and less than sanitary no-future temporary accommodation. I wrote a fortnightly column called New Town in The Straits Times Opinion page which I had hoped capture the colour and excitement of whole communities resettling themselves in totally new environments. Few people then were bothered about the legalistic details of the Home Ownership Scheme introduced in1964. There was, in fact, a 99-year expiry date, the necessity of which PM Lee Hsien Loong explained quite clearly. The country could not offer freehold ownership to such a large number of residents. Future generations would then be left with a shrinking land base to look forward to. Land has to be recycled. Anyway, 99 years is a long time. That was then in the 1960s-70s. Fast forward to 2018. The prospect of the lease getting shorter for the older flats in Ang Mo Kio, Bedok, Marine Parade, MacPherson, Queenstown (Tanglin Halt, for example) with others in parts of Toa Payoh which have not been renewed and even Jurong and Telok Blangah, has begun to worry some residents. Couple this with the fear that, past a certain point, the flats would become unsellable. 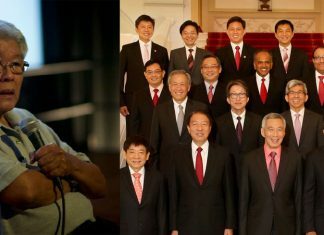 PM Lee has painted some of the possible options which have already been reported extensively by the mainstream press. I would not even reiterate them because everything is so much up in the air, nothing has been firmed up. Instead, the major portion of his speech was devoted to hailing the success of HDB – which we all know. And, in case you are unaware, this is his self-declared last term of office as PM. Understandably, the redevelopment of enormous chunks of the HDB landscape affecting huge populations would require a whole-of-nation approach. There is some urgency. It would need clear plans and the leadership – question is who? – to see them through. It would demand fresh thinking and feedback, particularly from younger Singaporeans who have grown up in existing estates and have a stake in the shaping of their future homes. One Singaporean who did not stay around to have any stake in the future of the country he grew up in is Kevin Kwan, author of Crazy Rich Asians, now a Hollywood blockbuster success which the Singapore Tourism Board is hitching on to promote the Singapore brand and attractions. He has absconded his NS liability and taken up US citizenship. As I see it, Kwan is both villain and hero. He should rightly be shamed for evading NS and, at the same time, ought to be celebrated for doing the country the favour of enjoying some fame in Hollywood, especially for other Singapore talents. The mature, rather more nuanced, attitude to adopt towards Kwan is to separate the man from his works which are objectively an achievement of a rare order. So what do we do if more Kevin Kwans – young Singaporeans who would pursue their dreams at all costs – continue to appear? There may be more as the Singapore diaspora expands. MINDEF has a clearcut answer: no exemption. Period. I will probably support MINDEF but lament the loss of much needed Singapore talents who could and would enrich the Singapore cultural scene. Sense And Nonsense is a weekly series. Tan Bah Bah is a former senior leader writer with The Straits Times. He was also managing editor of a local magazine publishing company.